Lord Mandelson has revealed the scale of his opposition to Jeremy Corbyn by saying he is working “every single day” to bring to an end his leadership. The ally of Tony Blair and former business secretary criticised Corbyn who, he claimed, had “no idea” of how to put himself forward for election as a leader in the 21st century. Mandelson has been a public critic of Corbyn since the veteran left-wing first won the top job in autumn 2015 but last night’s strongly-worded attack was one of his most direct so far. It came a day after Corbyn had said Blair’s speech on Brexit last week was “not helpful” and a Guardian/ICM poll showed Labour’s level of public support had fallen to 18 points behind that of the Tories. Mandelson insisted Labour could recover from its current poll rating but told the Jewish Chronicle event in London that this would not take place under Corbyn. Supporters of Corbyn point to the fact he has won two leadership elections in the last 18 months by an overwhelming majority but Mandelson said the former backbencher had the wrong outlook to run as a candidate for prime minister. “The problem with Jeremy is not that he’s a nasty man. It’s as if he’s in a parallel universe. He’ll gravitate to whatever revolt, insurrection, every protest movement in sight. 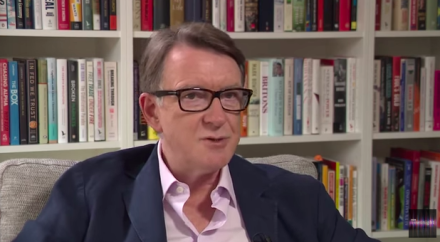 Following months of speculation that former ministers from the centre-left could respond to Corbyn’s leadership by forming a new party, Mandelson confirmed he would remain in Labour, saying: “Why do you want to walk away and pass it to Jeremy Corbyn? I resent it”. Blair has also ruled out leaving the Labour Party. Today allies of Corbyn hit back at Mandelson with equally strong language. “The idea of Jeremy Corbyn being prime minister and implementing policies that actually benefit the people terrifies the establishment, so it’s no surprise Peter Mandelson has found time in his busy schedule of spending time on oligarch’s yachts to attempt to undermine him,” a Labour source said.